If you care about your dirt bike and want it to run smoothly next summer, then spending a few minutes to winterize the bike is essential. Depending on how much time you have, the winterization process can either be very quick, or can take about an hour if you want to do a full and complete job–for those who obsess about their bikes. Personally, I do the full winterization on my dirt bike, and on the kids’ dirt bikes, I just go for the fast winterization method. Some people skip the step of removing the battery, and I think that’s a major mistake. You’ll end up buying a new battery in the spring most years if you leave your battery sitting without use throughout the winter. A new battery costs between $35 and $90 depending on whether you want the official Honda/Yamaha or whatever brand your bike is battery, or if you go with a third-party battery. Go get a smart charger and save yourself the cost of getting a new battery every single season. Also, you’ll need a smart charger periodically when you leave your bike’s battery turned on and need a jump, so it’s good to have one anyway. If you’re the kind of person who obsesses over their bike and likes everything to look perfect, then the full winterization method is for you. Start by getting some fuel stabilizer from Walmart or your local auto parts store and put the appropriate amount in the tank–following the directions on the bottle. Gas goes bad in about 4-6 weeks, so you really should not leave it in the tank all winter long. For this step, you’re really just heating up the bike so that the gas runs fully through all parts of the engine so that there isn’t stabilized fuel in the tank and unstabilized fuel in all of the lines and other parts of the bike. This also heats up the bike for the oil change that we’ll do later. 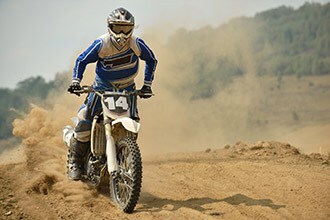 Turn off the gas tank using the silver selector switch (usually on the left side of the dirt bike). This will prevent gas from evaporating or leaking throughout the winter. The theory behind this is that dirty engine oil contains contaminants, and it’s not a good idea to have them sitting in the bike all winter long. While you’re at it, you may as well change the oil filter, although having an old oil filter in a bike that isn’t even running all winter wont’ really change anything. It’s just a good time to change the filter and get all of the contaminants out of the bike. Put new engine oil in the bike–making sure it’s rated for a dirt bike. Dirt bikes run much hotter than regular vehicles, so specially formulated oil is a good idea. Be careful as you tighten the bolts that you don’t squish and break the fragile rubber gasket, and also be sure to use a torque wrench so you don’t break the bolt off in the bike (yes, I did make that mistake). Get a quality torque wrench on Amazon and look in your manual for the specific torque settings of each bolt. You’ll likely find that they are only to be tightened to between 6-8 pounds of torque. Washing the dirt bike will ensure no dirt or mud from the season sticks semi-permanently to your plastics and makes the bike look older than it is. Give it a good wash and then wipe it down with a towel to get all the water spots off. Anytime you wash the bike, you should lube the chain as well to make sure it doesn’t rust. The chain should always have a generous amount of lube on it. You really can’t overdo it, but you don’t want it dripping everywhere either. Check the tire pressure on the bike and pump it up to the normal setting. Generally, this is around 15 pounds, but that depends on your tire and the style of riding you do. Removing the battery is the second most important thing you can do for your bike during the winter. If you skip this step, your battery will be weak by spring and you’ll likely need a new one. The problem with leaving the battery installed in the bike is that it will slowly drain over the winter. When a battery of this type completely drains all the way with absolutely no charge, it harms the battery and it won’t work at all, or won’t work well when you need it to run again. It’s best to get the bike off the ground and onto a stand so that there isn’t any pressure on the suspension throughout the winter, and to keep the tires from deforming. This also keeps the bike from getting knocked over and is more secure than simply storing the bike by leaning it against the kickstand. 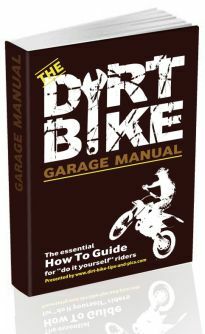 Toss a cover over your bike to keep dust off of it and to keep it out of sight of any potential theives who may pass in front of your open garage. No sense in advertising what’s in your garage. Winterizing a dirt bike is not a complicated process. It’s something you need to get done, but don’t obsess over it.